The Rabbit Tuffy is a real fur tug toy designed to really motivate your dog. The rabbit fur provides scent stimulation while the fleece stimulates your dog's bite, and the tassel at the bottom gives visual stimulation. 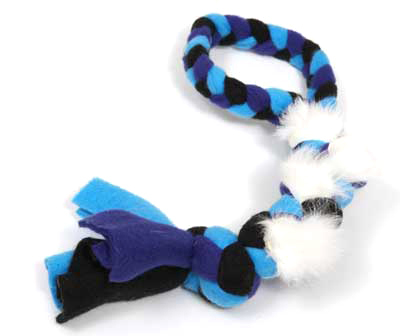 This tug toy has a soft braided fleece handle that's easy on your hands. 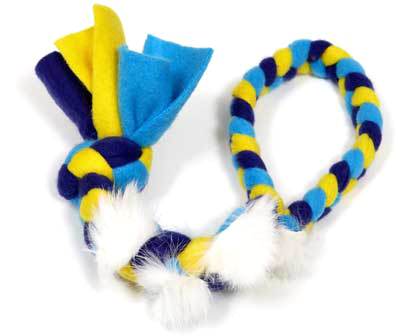 This tug toy is great for dog agility training and for teaching your dog to tug. The rabbit fur is stitched into the polar fleece for extra strength, however if you do have a tough tugging dog the soft fur hide may come away from the polar fleece. Sizes: Large 60cm long, Small 30cm long. Whilst this tug toy is machine washable, by doing so you may remove the scent.